With over 15 years of teaching experience, George Seccombe has developed fun and effective teaching methods, and adjusts these methods to fit his students' various learning styles and experience levels. Beginners especially appreciate George's patience and encouragement as they begin their musical journey. 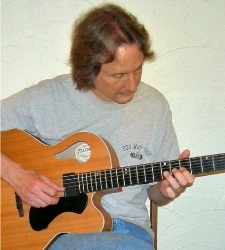 Advanced players will benefit from George's extensive knowledge of theory and technique, and can learn from his years of experience as a professional guitarist and singer performing many styles of music, including rock, country, jazz and classical. From his convenient and comfortable room at Alpine Music Studios in Woodinville, George offers extended hours, flexible scheduling, and most importantly, teaching excellence. See what people are saying about George by reading some of his Testimonials! Interested in taking music lessons? If so, you've come to the right place! George enjoys working with students of all ages. He has taught children as young as four, special needs students, teens, adults, and seniors. Need help with some other things? George offers a variety of services other than music lessons. From finding your perfect instrument to editing sheet music, George can assist you with your needs. Music has much to offer people of all ages, from casual hobbyists to advanced performing artists. Find out why learning to play music is a wonderful, life-enriching experience and a great way to connect with people.